In addition to chimney and fireplace construction and repair, Chimcare is experienced and skilled with a wide range of masonry projects around the home and yard, including patios, retaining walls, walkways, brick columns for lighting or a mailbox, and more! We can rebuild chimneys from the ground up, and create anything from firebox walls, fire pits, patios, pavers – basically any landscaping or building project involving brick and mortar, we can handle it with knowledge and expertise. When shopping for masonry contractors for your chimney or fireplace repair or rebuild, you should always choose one that specializes in the discipline. There are many building-code specifications for dimensions, materials, footings and reinforcements that are important when constructing a fireplace or chimney that is safe and built to last. Our company has over 20 years of experience building chimneys and fireplaces in the Pacific Northwest. We also do simple masonry repairs and restoration of fireplaces, hearths and chimneys. Chimcare also specializes in the two most important masonry protection and repair services: tuck-pointing and waterproofing. When the mortar between your bricks sags outward, it can be a symptom of a very serious structural integrity problem, and tuck-pointing is needed to correct it. This chimney care service involves scraping or cutting out the deteriorating mortar and then refilling (tucking) the joints with fresh mortar using the point of a trowel called a ‘pointing trowel’. 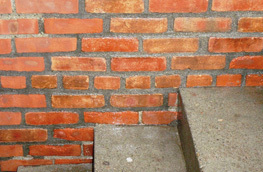 This can be made more effective and long-lasting by sealing the brickwork every ten years to decrease water absorption. Tuck-pointing is a critical maintenance task and keeps water from entering the brick wall cavity. 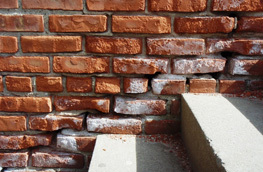 If water is allowed to get past the mortar and into the wall, brick failure may occur with problems such as cracking or spalling (popping off of the brick face). Failure to fix cracks in your joints can lead to very costly repairs, the longer an issue is left unfixed. Most masonry materials are porous and will absorb large amounts of water if left unsealed or damage is left unrepaired. The brick that is commonly used today is like a sponge, absorbing water and wicking moisture to the chimney interior. Over time, this moisture can create serious masonry problems. Defective mortar joints and the use of improper mortar or brick can greatly increase the tendency to absorb and convey water to the interior of the masonry chimney structure to result in even greater, more extensive and costly damage to your chimney and home. Masonry waterproofing materials today are vapor permeable, which means that they allow the chimney to breathe out, but not in. This means that water that has penetrated the chimney or moisture that has originated from inside is allowed to escape, while the waterproofing agent prevents water from entering from the outside. With our masonry waterproofing services, Chimcare uses ChimneySaver Water Repellent, which is the number-one water repellant for your chimney. It comes with a 10-year warranty and has been used by Chimcare for over 15 years! We trust in its effectiveness. Our masonry waterproofing service will reduce water penetration into the masonry by 99.9%, according to ASTM tests conducted at the university of Wyoming. Although the initial cost of masonry waterproofing may be a concern, it’s a critical step that will save you the major expense of large masonry repairs or rebuilding the entire chimney in the not-too-distant future, and as such represents a wise investment in your home. In addition to delivering a top-quality masonry job our masonry contractors work work hard to respect our clients by meeting deadlines, keeping clean, and providing accurate estimates and good communication. Contact Chimcare today to discuss your special masonry project, or to learn more about our other masonry services.